What is Cyberspace and Cyberpunk? In an interview in 1995, when asked to define “Cyberspace” Author, Media theorist and Culture Critic Neil Postman said “Cyberspace is a metaphorical idea which is supposed to be the space of which your consciousness is located when you're using computer technology, the internet for example.” (Postman, 2006 ). This gives us a very vague idea of what Cyberspace is, but cyberspace is kind of a very vague topic. In pop culture, the idea of cyber space is sometimes represented, like in a particular futurama episode, as a persons projected self floating around the internet as a combination of virtual reality and the cyber world. Moving on from Cyberspace, this week in class we focused on not only Cyberspace but Cyberpunk and were asked to read William Gibsons “Burning Chrome” and watch the cult classic “Blade Runner”. Funnily enough this isn't the first time I've had to watch Blade Runner for academic purposes (FTV in grade ten, looking at Neo Noir). If we were to try and define the genre of Cyberpunk, it can basically be described as “expressing (often dark) ideas about human nature, technology and their respective combination in the near future.” ("Cyberpunk Review ".). Watching the film Blade Runner is a perfect way to introduce ourselves to the ideas, themes and main concepts that make up the genre of Cyberpunk. Blade Runner, released in 1982, is set in a future almost dystopian world with robot/cyborg like beings (called replicants) and lots and lots of cool technology. Blade Runner is a cult classic and was pegged as one of the most influential films in establishing Cyberpunk, and neo noir flim, as their own genres (“Cyberpunk Review”). We are moving into a time now where there are so many different genres and sub genres of film, music, cultures etc. as well as so many new and crazy technologies being invented, at an astonishing rate too. 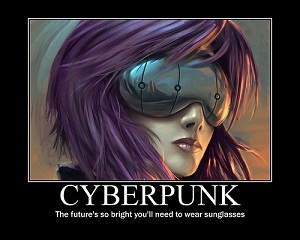 It's going to be amazing what cyberpunks- and the ideas of Artificial Intelligence, Cyberspace and the Virtual world- will be like in another decades time.